My apologies. Once upon a time this used to be a place you could come for match reports and to shake your head at an xG map and the odd Simpsons quote and that was your lot. But what I have realised over time is that if the article isn't up within forty eight hours of the game, nobody really reads them. And lately there have been a few things preventing me from writing about West Ham in a timely fashion, which means I write less about the games and instead deliver these more polemical pieces about the wider goings on at the club. In my defence, this time I've been bedridden for the best part of a week with labrynthitis and trying out that Dean Martin quote about not being drunk if you can lie down without holding on. It sounds funny when Dino says it, but when you're supposed to be at work in an hour, can hardly drink and you can't stop the world spinning it sounds a bit trite, let me tell you. So anyway, Saturday came and went and was, in it's own way, brilliant. I wouldn't say the performance was a classic, but perhaps that's the point. The thing I really like about Moyes is that we feel more like a proper team with him at the helm. So what if Watford were coming off a fantastic 4-1 win over Chelsea, and so what if we have loads of injuries and so what if it's the kind of day where the wind whips up the canals around the stadium like a razor blade - we're West Ham, and here's our well organised defence. All the best. And so it proved, as Watford turned out to be quite depleted themselves and never really looked like they would threaten us after Javier Hernandez found himself an inch at the back post and headed home a Michail Antonio cross. The Mexican had already had a similar looking first incorrectly ruled out for offside, and Marko Arnautovic had missed a chance so good that it should have come wrapped in a bow. But while it stayed 1-0 there was always a risk, as Watford dominated possession without creating all that much, and we continued to be dangerous without quite having the necessary cutting edge ourselves to fashion a second. So it was entirely apposite that we would eventually do so via a godawful corner that Aaron Cresswell overhit to Antonio, who in turn fell over, leaving Cresswell to smash the loose ball across goal, only for Orestis Karnezis to spill it straight back to him, and the ball to then ricochet back off Cresswell to Arnautovic to score a very nicely taken second just after squirting the keeper in the face with his plastic flower. Sometimes it is indeed better to be lucky than good. But for all that, we were well worth our win, and after everything shook out we are five points off the relegation places and six points off seventh. This season doesn't really make all that much sense. How's it been for you?" - The Vaccines, "A Lack of Understanding"
What was perhaps the strangest thing about this game was that it was probably the first time that you could point at the awful summer transfer window and see some sense in it. Apart from the ludicrous Joe Hart signing, this is what we were promised when all that experience came through the door, waving at all the wages and transfer monies going out the other way. Pablo Zabaleta was exemplary, nary allowing the dangerous Richarlison a kick and displaying the near psychopathic levels of desire that have characterised his best performances. He remains too inconsistent for my liking, and better teams have tried and succeeded to expose him positionally, but on days like today you can see the short term merit of his signing. Ahead of him Hernandez and Arnautovic were dovetailing nicely and, crucially, were now running the necessary miles to justify their places in the team relative to the reverse fixture at Vicarage Road. The latter, especially, was splendid and with each passing week you can see his chest puff out a little further and his standing grow with the fans. It isn't so much what he does, but it's almost more the promise of what he might do. One first half run took him past four Watford defenders in a single move and probably cemented him the Hammer of the Year trophy with that one shake of the hips. It should be Angelo Ogbonna, of course, but let's not fall out before I've even said anything remotely controversial. There were lots of other positives; the way Cresswell and Ogbonna have shored up a leaky back four, the confidence that spreads out from Adrian like water through the roots of a tree and the manner of Mark Noble's resurgence and the way he has grabbed his threadbare team and dragged them through this most challenging of times. I have no time for the concept of the Captain in a football team, but in the last month Noble has changed my mind a little. Also welcome was the return of Antonio who continues to combine the qualities of a thoroughbred racehorse with those of a buffalo falling down a ravine. Here, he was deployed at left wing back in a return to the darkest days of the Slaven Bilic regime but he did alright except for when he was asked to defend, and then it was like watching one of those home videos of someone painting their roof by perching a ladder on a cement mixer and attaching their paintbrush to the end of a shotgun. For all that, the brilliance of his deployment on the left was the way it matched him directly against Daryl Janmaat who also defends like a man who has never before contemplated the notion in his life. And there you have it. This was perhaps the perfect example of what Sullivan apparently envisioned when he sat down with Bilic and decided to buy as many old, slow players as they could get their hands on. And so 34-year-old James Collins kept Troy Deeney under wraps, 33-year-old Zabaleta ran himself into the ground, 28-year-old Arnautovic was the difference and 29-year-old Hernandez is scoring goals and thus justifying his place. We were supposed to get at least of season of this short term usefulness before they all became dead weight on the wage bill and perhaps it's pretty telling that it took a different manager to Bilic to make this mess of a squad look coherent. - Elvis Costello, "Oliver's Army"
But if you are a West Ham fan of a certain vintage you will recognise that familiar feeling of impending doom. The uncomfortable sense that what is happening on the pitch is quickly becoming a mere supporting turn to the drama about to unfold around the club. "You can only sign the players the manager wants and the manager must sign his own players" - Well okay then - thanks for Payet and Lanzini, Slav! 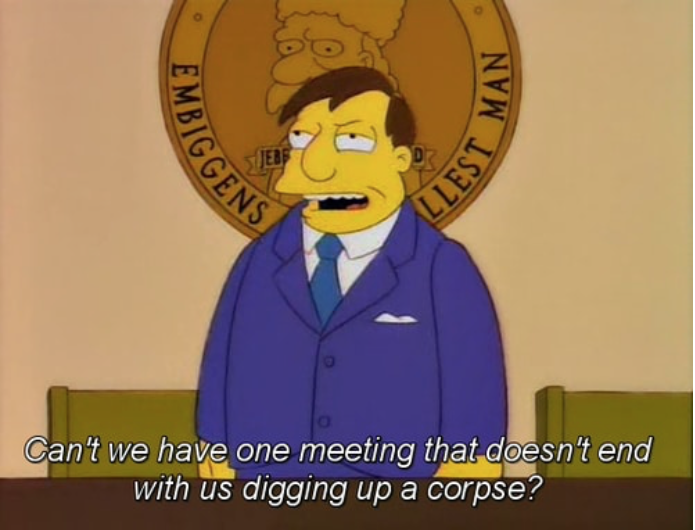 "I'm going to delegate the whole thing to a huge analysis and scouting system with a new Head of Recruitment. We'll have a massive video analysis department, increase the scouting department, every player will be looked at five or six times, we won't be signing a player when the manager's never even seen him play. The manager's going to go and watch him play and we hope we'll spend our money better"
Now if you're anything like me you read that and immediately thought "Well, what the hell was happening before?". Perhaps the most alarming piece of this is that Sullivan is still propagating this idea that the manager must have final say on all new players, and seemingly forgetting that he has parted way with four managers in his eight years here, and that when the new one arrives they all want to buy new players. Sullivan is essentially putting forward a Director of Football role that is so watered down that nobody of any repute would want it. There is no mention of reshaping the culture of the club, or a top down reorganisation of the playing structure and Academy. Instead it all just vague murmurings that suggests he still doesn't understand the problems. Managers, however, will be queuing up for the job as they will be racking up millions of air miles flying all over the globe looking at the hundreds of players we're considering signing. Doing that and preparing a Premier League side each week should be a piece of cake. I shouldn't grumble too much, I suppose, as this is at least a public admission that he is part of the problem, but I'm afraid I can't get that excited. Many wiser men than me have said of this chairman that you have to judge him by what he does and not what he says, and I'm afraid that applies again here. One last point on this before I digress further still. You could make an argument that the problem hasn't completely been about identifying good players in the last few years - it's been about signing them. The club at least floated the names of William Carvalho, Leander Dendoncker, Keita Balde, Carlos Bacca and Alexandre Lacazette but failed with their bids because the financial side wasn't up to scratch. A new Head of Recruitment will have no impact whatsoever if he is still given an insufficient budget by Sullivan. The reality is that however far Sullivan thinks he is backing away from the process, it won't be far enough. We need him to recuse himself from the day to day running of the club and leave it to the professionals. Until that happens, this is all just window dressing. Sometimes I think that as West Ham fans we have got too cosy with failure. We are too forgiving and too accepting of falling short, generally sucking it up with a phlegmatic nod to our mums and dads and granddads and telling ourselves that it has always been this way. The more glorious, the more we embrace it. The FA Cup in 2006, finishing third in 1985/86 and even the doomed Champions League hunt of 2015/16 - just to name the most recent examples. In each case we celebrate these things but know we could have grasped higher and gone further if we'd got luckier or been slightly better prepared. But what we have experienced in the last eighteen months doesn't fit into that narrative. Losing 4-1 at home to Swansea when you have fourth place in your grasp isn't the same as being told that you're moving to a world class stadium and arriving to find that fans in the first row have to courier the ball back to the pitch when it goes out of play. We have been failed, and that is the sound to which our fans are marching. It's a march to the music of failure. Personally, I would build up to a march because this is a long game now, and a march is a blunt force instrument that doesn't seem all that well suited to achieving the disparate aims that exist within the fanbase. Some want the board gone, some want them to step back, some want us to find a new stadium and some want a new badge. And that is the problem - I don't know what the march is for. I want to back it, but I'm not marching for a new badge because that's mad. I've been discussing this with some other supporters and their thinking is that it doesn't matter whether the march has coordinated aims but instead it's there as a show of strength and a statement that enough is enough. Something has to change and here are twenty thousand people in support of that position. And fair enough - God knows I've spent long enough outlining why I agree. When do we want it - NOW!" I'm not trying to undermine or belittle anyone marching - genuinely - but when this appears in the media it's not going to make sense to anyone outside West Ham, and while we might not think that matters it's actually pretty important. Each of Sullivan, Gold and Brady are desperate for public approval. An incoherent message hurts us and strengthens them. Personally I would have built up to a march. A red card protest, a black balloon protest, some well placed newspaper think pieces about those accounts when they come out, a turning the back moment from our away following - suddenly these things are in every match report and instead of the West Ham board, they are the "embattled" West Ham board, the "under fire" West Ham board, the "besieged" West Ham board. At that point it's not whether change will come, it's what change will come. But that's gone now and the march is the way forward and I support everyone on it, I truly do. My own view is that regime change is a very risky proposition because, incredibly, there are owners out there who make Sullivan and Gold look like Sheik Mansour, but I accept that the vast majority disagree with me. And if that's the case - then make that the aim of the march and let the cards fall where they may. Their handling of the stadium move alone means they deserve every bit of opprobrium that comes their way. And whatever anyone thinks of the march, it can't be denied that these owners have failed us and we do deserve better. West Ham deserves better. We might have been allowed glorious failure to be baked into the DNA of the club but it doesn't always have to be that way. We can and will achieve more than these owners have allowed us. "She'll carry on through it all"
But amidst all this gloom, I should also say that I see light. I was given a small reminder of that before this game, as my ten-year-old and I were running along the various impenetrable waterways that protect the London Stadium as though designed by the architect of a medieval castle. We were delayed by TfL, as usual, and the rain was pouring in sideways and reddening our faces as the familiar pre-match music was creeping like mist over the stadium roof. Then "Bubbles" came on as we jogged up to security, and in that moment my daughter turned to me and started singing along, hands in the air and a big grin on her face. Not for her any worries about the lack of pace in our defence, or the rates of interest that we pay on our loans, or the badge that adorns the front of her Cheikhou Kouyate shirt, but a simple expression of joy at the fact that the next two hours were loaded with possibility. And of course, that's how it should be. The fight that we are in as fans is just as transient as those who own our club. West Ham will prevail because it always does, and because our club exists not in balance sheets or Premier League money tables or even the London Stadium. It lives instead in the side streets and school playgrounds, and hospital wards and pub saloon bars and on bedroom walls and in the arms of ten-year-old girls who hear "Bubbles" and immediately start singing it, even in the teeth of a howling gale. And that is what our fans are marching for. The acknowledgement that our club exists for reasons other than to make money for people who don't have the ability to take the club forward, but are instead content to leave us in a state of failing inertia in order to pad the growth of their investment. And while I might not completely agree with the tactics of those fans, I absolutely understand and empathise with their frustration. To dismiss it as the actions of hotheads is to fail to understand the tinderbox atmosphere that exists between us and the owners. These latest noises from Sullivan and Gold are therefore too little too late. They ignored us for too long and at their peril, and we will take our club back because we will outlast them. 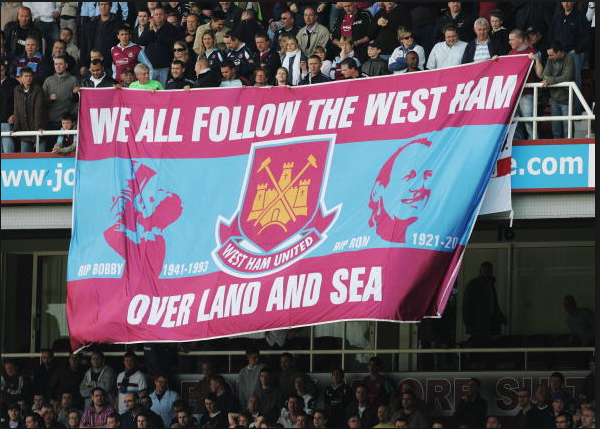 For that reason I don't object to the leaders of the Real West Ham Fans group meeting with the Board before the march. That was the whole purpose of the group in the first place, I thought. But the wider concern I have is what exactly it is that some people seem to think they will be getting back. Which of the fifteen versions of the club badge is the acceptable one? If wishes were plastic seats we still won't be able to raise the ashes of the Chicken Run from the Upton Park dirt. Pray as we might, but Geoff Hurst isn't going to lead the line at Liverpool. - The immediate installation of a fully qualified Director of Football, who is given complete control of the playing affairs of the club. The current chairmen will step down from whatever day to day involvement they have in the football side of the club. - Elected supporter representatives on the board to hold the club to account. - Those loans fixed at commercial rates and no higher. - Regular dialogue with supporter groups to address the myriad problems with the stadium and an end to this fiction that everything is ok while the roof is literally leaking over our heads. Everything at present is reactionary and coated in the gleam of self denial. - If fans believe that the club has lost touch with it's past then it really isn't that difficult to fix. Celebrate better the achievements of our past: Pick selected matches to specifically cherish and promote any of the following: the first three black players in a top flight English side - Clyde Best, Clive Charles and Ade Coker; the 1964 European Cup Winners Cup Runners Up; Ron Greenwood; Vic Watson; Steve Potts; the West Ham Academy - whatever, really. In some ways it doesn't matter what you remember, so long as you're remembering. There is a difference between endlessly looking backwards in the hope of recreating a mythical past that didn't even exist then and standing on the shoulders of giants to move the club forward. I'm not advocating a weekly nostalgia session to distract ourselves from what's in front of us, but more an effort to make our rented accommodation at least seem a little more like home. It really wouldn't be that tricky to get giant banners of Watson, Lampard Sr, Bonds and Greenwood in the four corners of the ground would it? So you might agree with all that or none of it, but the point I'm trying to make is that an effort to make the London Stadium seem like home, and pulling our history closer to our fans shouldn't be that difficult. In fact, none of this stuff really feels that difficult if you've truly got the interests of the club at the centre of your agenda.